The searches were carried out after information was received of suspicious cash holdings, and are linked to suspected movement of unaccounted money ahead of the elections and alleged tax evasion, officials claimed. Sparking A political war of words between the Congress and the BJP barely days before the beginning of the Lok Sabha elections, the Income-Tax Department Sunday conducted searches across 50 premises in Delhi, Indore, Bhopal and Goa that are allegedly linked to relatives and aides of Madhya Pradesh Chief Minister Kamal Nath. The searches were carried out after information was received of suspicious cash holdings, and are linked to suspected movement of unaccounted money ahead of the elections and alleged tax evasion, officials claimed. Over Rs 9 crore was found during the searches apart from some documentary evidence, which is being scrutinised, a senior official claimed. The premises searched included offices and residential premises of Nath’s Officer on Special Duty (OSD) Praveen Kakkar, former advisor R K Miglani and executives linked to his brother-in-law Deepak Puri’s firm Moser Baer and his nephew Ratul Puri’s company. Kakkar, a former police officer, was appointed OSD to Nath after the Congress-led government came to power in the state in December. The Enforcement Directorate had last week questioned Deepak Puri and his son Ratul Puri in connection with the AgustaWestland chopper scam. Senior tax officers in MP told The Indian Express that they did not have any information about the searches, which began early Sunday and continued late into the night, since teams from Delhi were supervising them. Officials said the I-T teams were accompanied by CRPF personnel in Bhopal and Indore, leading to a brief confrontation with local police. MP police claimed they had received complaints from residents of properties being raided that they were not allowed to attend to emergencies like medical treatment. They said Indore SSP Ruch Vardhan Mishra was denied entry when she reached the properties belonging to Kakkar. Late Sunday, a CRPF officer claimed the situation was under control. Officials said premises belonging to Kakkar were searched in Indore and Bhopal, and those linked to two of his alleged associates, Ashwani Sharma and Prateek Joshi, were also raided. The raid at Sharma’s residence and office in a multi-storey building in Bhopal nearly led to a confrontation between the CRPF and police. Kakkar opted for early retirement in 2004 and joined the Congress. He was private secretary to former Union minister Kantilal Bhuria. Miglani, who has been managing Nath’s election campaigns over the years, had also been appointed OSD to the Chief Minister but resigned recently. He is said to be managing the campaign of Nath, who is contesting an Assembly bypoll election, and son Nakul Nath who has been fielded from Chhindwara for the Lok Sabha. Officials said MP’s Chief Electoral Officer (CEO) has conveyed to the Election Commission that he was informed about the I-T raids at premises belonging to Miglani and Kakkar by a designated Income Tax Nodal Officer (ITNO) around 8 am Sunday. 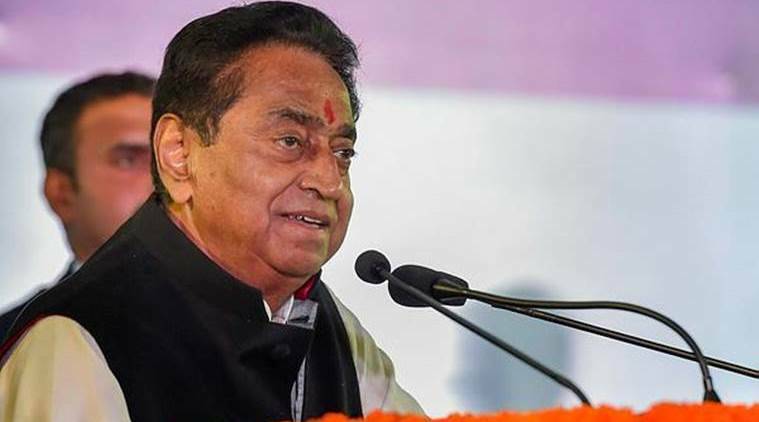 However, Kamal Nath said the circumstances surrounding the raids were not clear and accused the BJP-led central government of misusing Constitutional institutions. “They use these agencies to scare (opponents) when they have nothing to show for development. The BJP has sensed defeat in the Lok Sabha elections and is resorting to such activities to exploit them politically. Even in the Assembly elections, they had resorted to such tactics,’’ the CM claimed. Former CM and BJP leader Shivraj Singh Chouhan claimed that the government was afraid. “At whose instance did the police go to Ashwani Sharma’s house?’’ he asked. Over the last couple of months, the Opposition BJP has accused the state government of “making money” from transfers. Senior BJP leader Kailash Vijayvargiya claimed that the raids have proved that “only thieves had complaints against the chowkidar”.